The Tatmadaw has acquired civilian aircraft made by European companies despite a tightening of the arms embargo in response to alleged atrocities in Rakhine State. A spokesperson for the ruling party has blamed “some in the bureaucracy” for the country’s poor economic reform, saying excessive redtape is a “stumbling block in Myanmar’s democratic transition”. The world now has more refugees than at any time since after WW2, more than the population of Britain. They are often the consequence of wars usually instigated by great powers directly or through proxies. Civil strife accompanied by the demonization of minorities, killing and expulsion is another reason. Such is the story of the Rohingya in Burma, or Myanmar as it now likes to be known. From October 1 to December 28 of 2018-2019 fiscal year, the border trade volume reached USD 2135.078 million, down USD 6.04 million compared with the same period last year, according to the figures from the Ministry of Commerce. For Ma Htwe, there is no other realistic option than to leave an internally displaced person’s (IDP) camp in Myanmar to join a government resettlement program. The United Nations has appealed to all sides in Myanmar to intensify efforts to find a peaceful solution to the situation and to ensure humanitarian access to all people affected by the violence. The preliminary work for the Mandalay-Muse rail project, which is among the among the projects under China’s Belt and Road Initiative (BRI), will start next year, a senior Mandalay finance official said. There are about 40 mining blocks waiting for recommendations from respective regions and states, but operation will be allowed only after contract signing and test running, said Min Min Oo, permanent secretary of the Ministry of Natural Resources and Environmental Conservation. Thousands of Rohingya living on no-man’s land on Myanmar-Bangladesh border are caught on sidelines of fierce clashes. Myanmar President Win Myint has expressed his interest in working more closely with Prime Minister Sheikh Hasina to address the common challenges of both countries. Myanmar’s Shan state is the epicentre of the global methamphetamine supply and the export of the illegal drug is about to get even easier, warns a new report from the Brussels-based International Crisis Group (ICG). The long-awaited Yangon City Development Law, which now forms part of the legal back-bone of the Yangon City Development Committee (YCDC) and which sets the future of the commercial capital’s development planning, officially came into effect on October 1 after being signed into law by Yangon Region Chief Minister Phyo Min Thein on June 28. A Rakhine political party said Wednesday that it will hold a meeting in Rakhine state’s capital Sittwe to discuss a warning by a central government spokesman this week against support for the region’s ethnic military force following a deadly attack it conducted on police outposts. 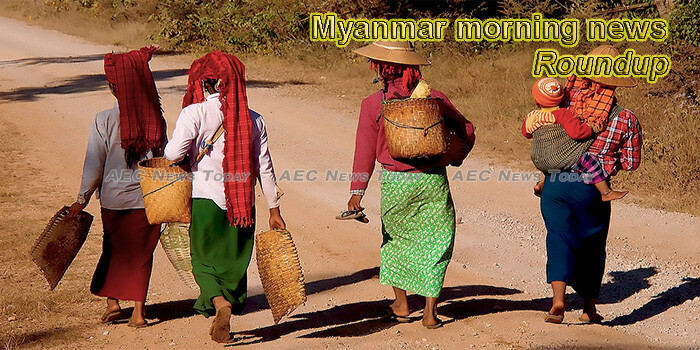 The Myanmar Ethnics Culture and Tourism Promotion Festival will be held in Kyaikkasan Grounds from January 25 to 29 with the aim to promoting traditional culture and customs and tourism of each region. Magwe Region’s Chauk Township hospital has run out of the rabies vaccine as more and more people have been seeking treatment for dog bites, the hospital’s superintendent Dr Soe Win said. The company has a long track record in Southeast Asia, including in Myanmar, where it is operated under the Cycle & Carriage automotive brand. Cycle & Carriage distributes Mercedes Benz passenger cars in Myanmar, Singapore and Malaysia. An International gems and jewelry fair kicked off in Myanmar’s Yangon Wednesday, putting on sale processed gems through sealed-bid auction. The Ministry of Health and Sports has been allocated K3 billion (US$1.9 million) for research in its budget for fiscal year 2019-2020 to improve its clinical and public health services, especially in the areas of paramedics, nursing and midwifery. A direct flight was launched Tuesday between Guiyang, capital of southwest China’s Guizhou Province, and Mandalay, Myanmar’s second largest city.